What a day we have had at Marina Bay in Singapore! We checked out of our hotel in the Bugis district around 9:30am to head to the Singapore Flyer, the second largest Ferris wheel in the world; Soon to be surpassed by the High Roller in Las Vegas. The Singapore Flyer stands at 180 meters tall. Each car can house up to 28 passengers! We had no trouble fitting all 19 of us in one car! 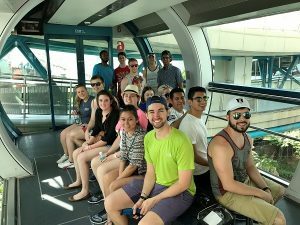 After our 28 minute ride around the ferris wheel, we boarded one of Singapore’s duck boats for a land a sea tour of the Marina Bay area. The bay in Singapore is fresh water. Even though only a dam divides the fresh water from the seawater, the entire bay has been desalinated to assist Singapore’s efforts to eliminate their water dependency on other countries. 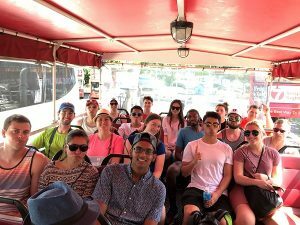 Our duck tour consisted of a thirty minute drive around the city, and a cruise in the bay, highlighting the Singapore Flyer, the Singapore Merlion, the skyline and finally, the Marina Bay Sands. After a morning of excursions, we are now able to check in to the five star Marina Bay Sands, our hotel for the night. A hot day of 93 degrees and 92% humidity, perspiration was present whenever we walked from point A to B. A cool room and a pool with a view are a delightful motivation. Before we can head poolside, the gardens by the bay remain our last sight to see. Dropping off our bags in the room, we ventured out again into the heat. 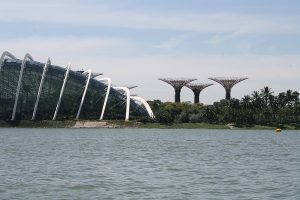 Nearly a $1 billion development, the Gardens by the Bay capture the natural beauty present in our world in two single-layer dome conservatories. These conservatories contain flowers and species of trees from all over the world. One of the glass dome’s features a man-made mountain with the world’s largest indoor water fall. (over six stories tall) The mountain portrays the genealogy of our world, from nature’s perspective. The top of the mountain features a garden of pre-historic times. Each level below moves a millennia at a time, bringing us to present day at base of the mountain. 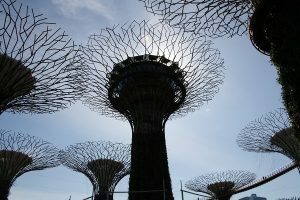 Another unique sight at the Gardens by the Bay are the garden’s 18 Supertrees. 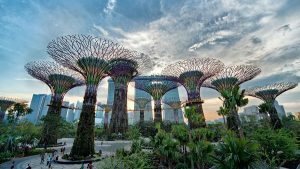 Composed of a reinforced core and steel superstructure, these super trees range from 20-50 meters in height and are decorated with multiple species of ivy and other invasive plants to wrap the tree’s hot steel. These trees are equipped with solar panels to provide the light at night and cooled conservatories to blow cool air around the park during the day. One can’t help but feel like you have suddenly taken a trip into James Cameron’s Avatar being amongst these Supertrees! 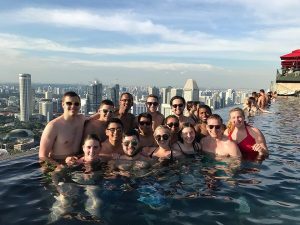 At long last, the longest infinity pool in the world bekons, and we are answering its call! 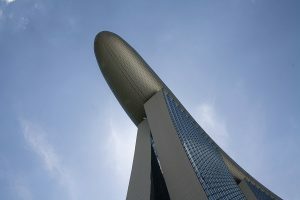 The Skypark at Marina Bay Sands atop the three 57 story curved building. The Skypark boasts the longest infinity pool in the world, spanning the three towers for 490 feet. Facing the skyline to the West, the arm rail over-looking the edge is the place to be in the afternoon. The skypark has a capacity of 3,900 people. The North side of the skypark features the observation deck, which sits on the world’s largest publicly accessed cantilever, overhanging the third tower by nearly 220 feet. We enjoyed the pool through the afternoon, into evening, to sunset.